Using IPDI and IPDA as reference materials, keeping the molar ratio R (R=n diisocyanate/n polymer polyol/n chain extender) unchanged, and examining the effect of polymer polyol type on the structure and properties of polyurethane resin . As can be seen from FIG. 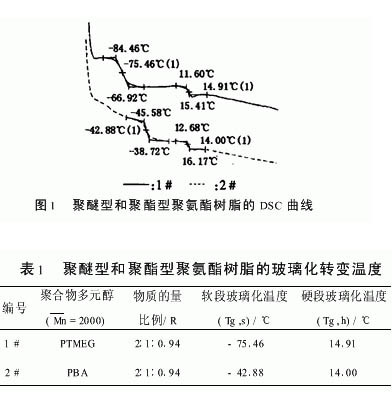 1 , when the composition ratio R of the component material remains unchanged, the Tg,s of the PBA-based resin coating is higher than that of the PTMEG-based resin coating, while the Tg,h is lower. The imino group >NH of the hard segment of the polyurethane resin may form a hydrogen bond with the urea carbonyl >C=O in the hard segment, and may also form a hydrogen bond with the % DO% D and the ester carbonyl >C=O (polyester type) in the soft segment. The former promotes microphase separation while the latter promotes microphase mixing. Sung et al. found that in the hard segment, the degree of hydrogen bond between imino groups >NH and urea carbonyl>C=O is high, while the ester carbonyl>C=O in the soft segment forms a small amount of hydrogen bonds. The polyester-polyurethane soft segment contains a strong polar ester group, and the hydrogen bonding force between the soft segment and the hard segment is much greater than that of the polyether type, and the internal rotation barrier of the segment motion is high, which is not conducive to the soft segment and hard Due to the incompatibility of thermodynamics, the segments are agglomerated into phases and have a low degree of micro-phase separation. The AFM test pattern of 1# and 2# resin coatings also confirms this point. The hard segment micro-area size of the polyester resin coating film is smaller than the polyether type, and the soft and hard segments have better compatibility. This is consistent with the results of studies on polyurethane urea using small angle X-ray scattering (SAXS). It can be seen from Table 2 that the tensile strength of the PBA-based resin coating film is higher than that of a resin coating film made of PTMEG of the same molecular weight and the elongation at break is lower than that of the polyether when the composition molar ratio R remains unchanged. type. Since the cohesive energy (12 2 kJ/mol) of the ester group is greater than the cohesive energy (4 2 kJ/mol) of the ether group, the intermolecular force is greater; the lower micro-phase separation makes the soft and hard segment compatible The hard segment micro zone has a strong reinforcing effect on the soft segment phase, so the hardness and tensile strength of the polyester coating film are higher than that of the polyether type. Because the steric hindrance effect of the ester group is large, and the ether group (â€”COâ€”Câ€”) is a linear segment, the internal rotation barrier is low, and the molecular chain flexibility is better, so that the elongation of the polyether coating film is extended. The rate is higher. The test results of printing suitability show that the inks prepared by 1# and 2# resins have good web-crossing performance, and no drawing occurs during the printing process; the film-forming performance during printing and coating is better, and the flexibility is good; the binding at 70Â° C. Overlapping for 30 minutes, the blocking resistance is 2# better than 1#. The improvement of the anti-blocking property is due to the higher polarity of the ester group, which increases the surface hardness of the printed coating film and enhances the intermolecular force. The adhesion test results are shown in Table 3. It can be seen that the coating adhesion of 2# is better than 1#. This is because the polar amide group in the nylon fiber can form a hydrogen bond with the ester, ether, urethane, urea, etc. groups in the resin. The polarity of the ester group in PBA is higher than that of the ether group, which contributes to the improvement of the adhesion of the printed film to the nylon fiber. When the resin component molar ratio R is the same, the microphase separation degree of the PBA-based resin coating film is low, Tg, s, hardness and tensile strength are higher than those of the resin coating film made of the same relative molecular mass PTMEG, and Tg,h And elongation at break is lower than that of polyether type; polyester polyurethane resin has better printing adaptability and adhesion. KD structure metal Tier Locker would be assembled within 5-8 minutes. All quality cold rolled steel are used for our Metal Office Furniture. Each door for staff Metal Lockers has one name card holder and one air vent. We accept customized lockers with different dimensions and styles available. Also, different lock system and handles are available for any customer.